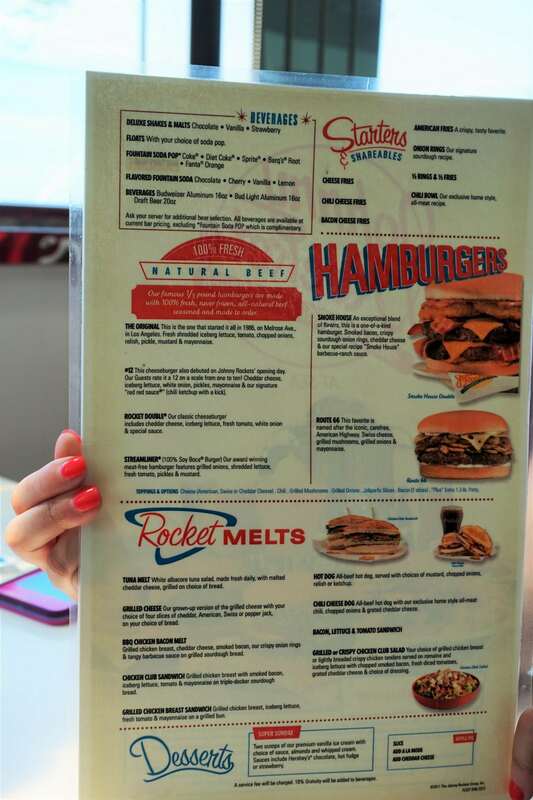 We have been sailing on Royal Caribbean for over 10 years now and have never dined at Johnny Rockets for lunch or dinner. Well, we decided to put an end to that on our latest trip. 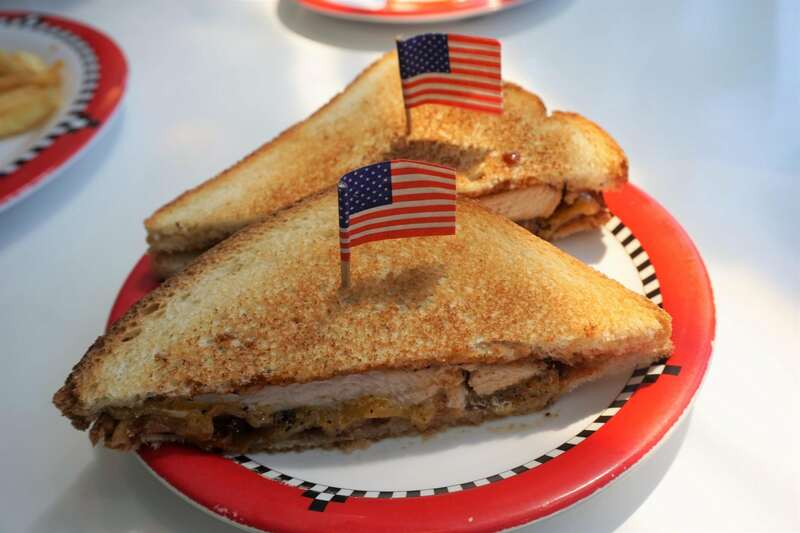 Skipping the busy Windjammer buffet, we dined at Johnny Rockets for lunch on embarkation day on our recent Majesty of the Seas cruise. 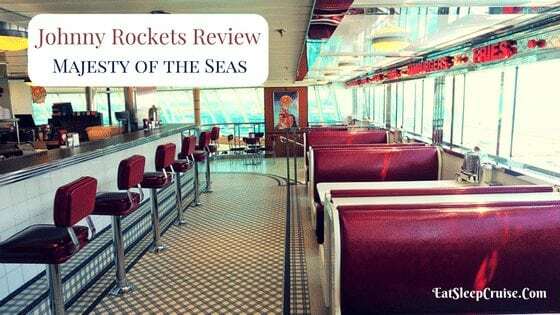 Of course, we needed to report back to you all the juicy details of our experience at this casual restaurant in our Johnny Rockets Majesty of the Seas review. We had decided ahead of time that we would give this up-charge restaurant a test run on embarkation day of our Majesty of the Seas cruise. Upon boarding the ship, we received a coupon for a 20% discount, which was technically good for all port days of the cruise. On the three day cruise, this discount would have been valid any day of the cruise since there were no sea days. After completing our customary photo tour of the ship, we were ready to try out the restaurant for lunch around 12:30pm. The venue was relatively empty, with only a few tables occupied by fellow cruisers. We were greeted rather quickly by a friendly waiter who instructed us to sit at any available booth. Once we were all settled, our waiter came by with menus and described the the different offerings and additional charges. For the cover charge of $6.95 a person, the menu was all you could eat EXCEPT milkshakes, which cost approximately $6 more. Taking our drink order first, we had a few minutes to review the menu before our waiter returned. With our order then placed, we had a plate of fresh and very hot French fries and onion rings delivered to our table just moments after ordering. Both of these tasty offerings were a step above similar options from the buffet. The Princess went beyond her basic grilled chicken and ordered the BBQ Chicken Bacon Melt for her meal. How can you go wrong with a tangy barbecue sauce and crispy bacon? Yes, it was quite good but messy. For once, she need more napkins than I did during a meal! I debated back and forth what I should order but finally settled on the Route 66. Freshly made with a nice mixture of mushrooms and onions, it was definitely one of the best burgers that I have had at sea. Not to mention, the food literally came right off the grill. So, it was hot and custom made to our specifications. 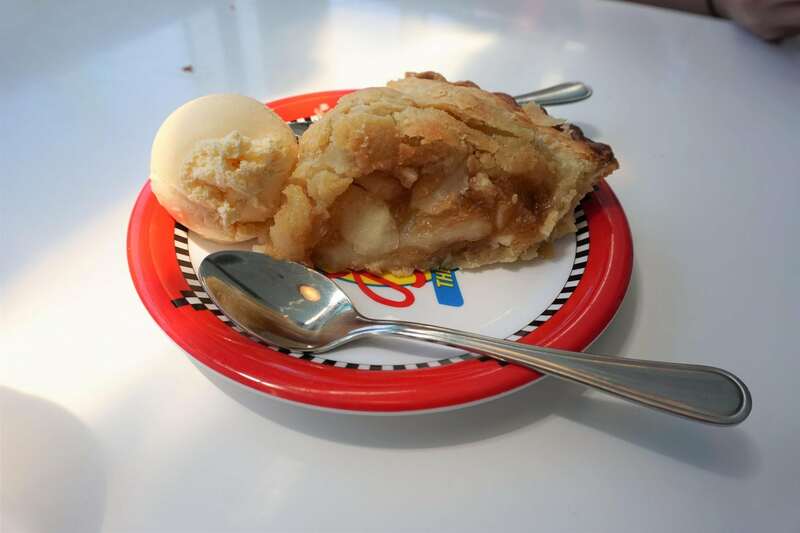 Not that we really needed to get dessert, but the Apple Pie a la Mode was speaking to us. Somehow, we found room to split a piece. The pie had a mildly sweet yet tart filling and a light flaky crust. It was definitely worth the extra calories. Overall, Johnny Rockets on Majesty of the Seas was a nice departure from the typical lunch scene on embarkation day. We would definitely return to this up-charge restaurant for lunch or a casual dinner in the future. We were pleasantly surprised on the overall quality of the food, as it was freshly made, well seasoned, and served hot and fresh out the kitchen. Our waiter was also very attentive during the meal. The quiet restaurant served as the perfect alternative to the often congested Windjammer Cafe. 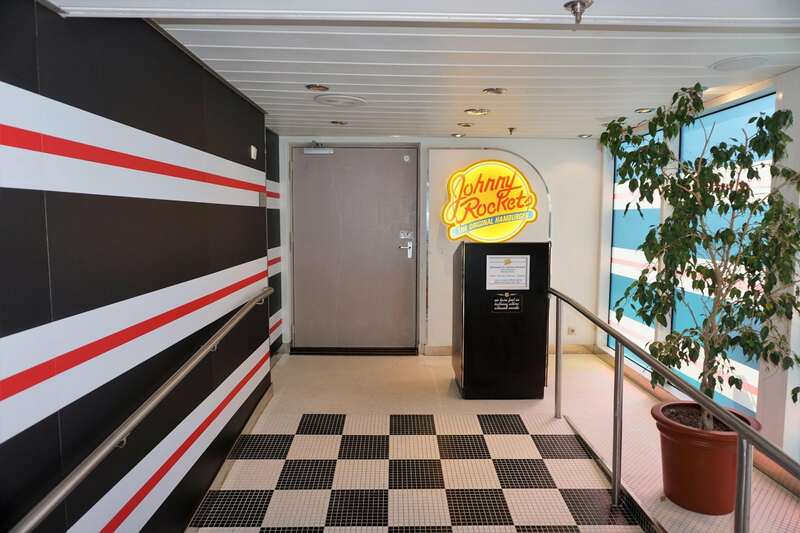 Have you dined at Johnny Rockets on Majesty of the Seas or any other Royal Caribbean ship? What is your favorite casual cruise ship restaurant? Drop us an anchor below to share your restaurant reviews with fellow cruisers. 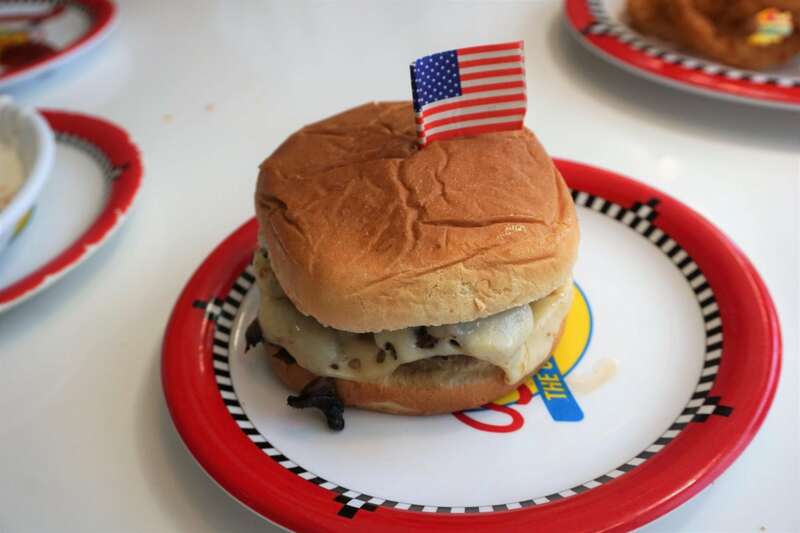 Yes, I have dined at Johnny Rockets on the Oasis and Liberty of the Seas. Breakfast at Johnny Rockets (included in cruise cost) on Oasis was a welcome change to Windjammer on a back to back cruise.. Took our 15 year old granddaughter with us on the Liberty and she wanted to eat dinner at Johnny Rockets. Was not impressed, at all. Have eaten at Johnny Rockets in Myrtle Beach, SC and it was at least entertaining. 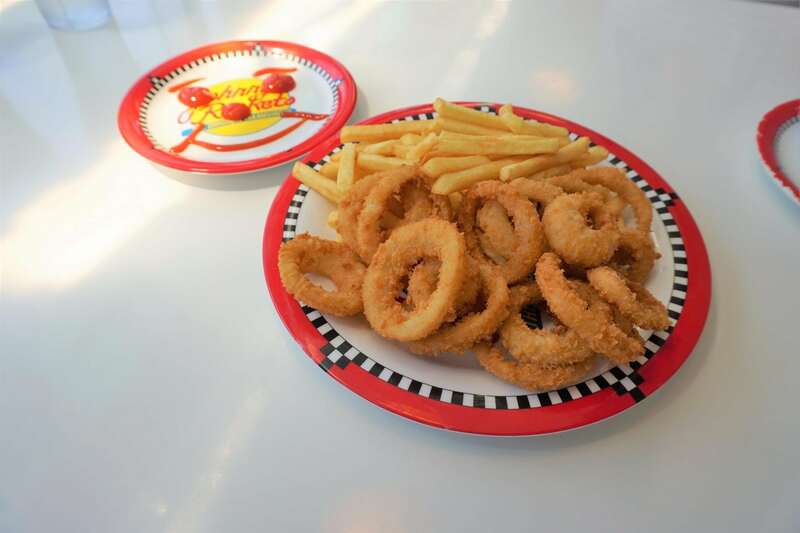 A Johnny Rockets opened in a mall close to home in Texas and didn’t last very long due to poor selection of items. 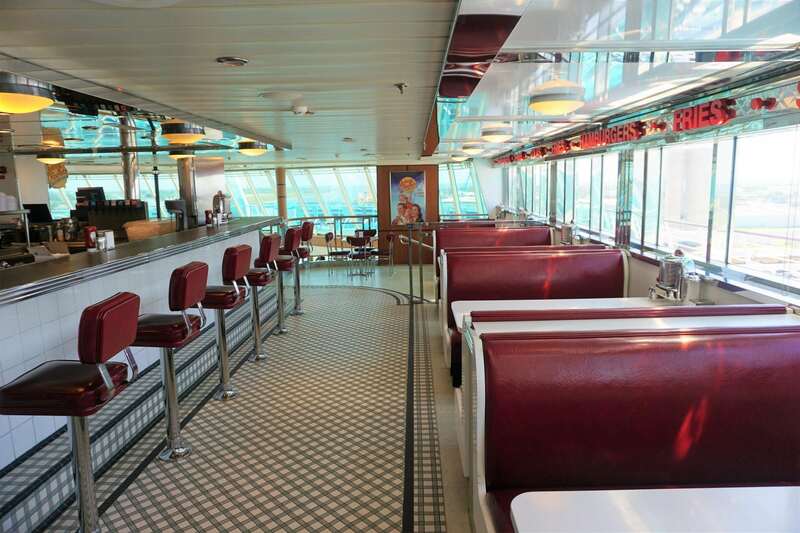 Frankly, for us there was no WOW factor at Johnny rockets on either ship. Save your money and eat a hamburger in the Windjammer. 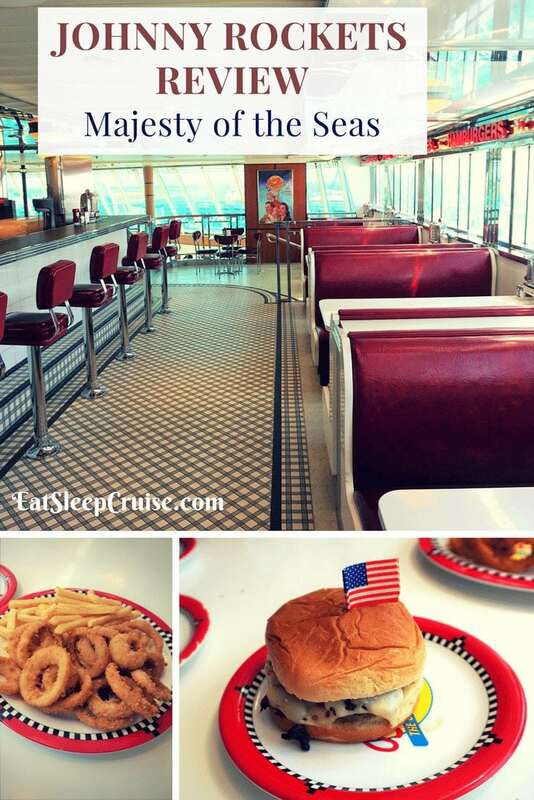 We ate at Johnny Rockets on Majesty this past week. The staff was wonderful and the music fun. The fries were great- hot and crispy. The onion rings were good too. I ordered the #12 burger and was disappointed. The flavors were good, with onion, pickle, and their spicy-ish ketchup. However, the burger itself was hard and overdone. The meat had no flavor to it at all. We grill and fry burgers at home that are way better than what I had. I was really looking forward to an outstanding burger. I would definitely not pay the extra money to eat there again. Hopefully, my experience is different than others and it was a fluke. Hi Katie, thanks for the feedback. Happy Cruising.